Marc about 1/4 of the way up Thunder Mountain. I did not take many pictures of family events in 2004, mainly because I did not spend much time with our family this year. I started the year in Machu Picchu with Adele. We were into the 2nd week of our 3 month world tour. We returned home on the Spring Equinox, March 22nd, after an incredible journey and adventure. In April we drove up to Colorado to visit Crestone and Mesa Verde (pictures to follow eventually). We met a lady in Luxor, Egypt, on our 3 month "World Tour" who owned a house in Crestone that we were curious to see. We also drove out to see the Tibetan Buddhist Stupa dedicated to the previous incarnation of the present Karmapa. In May I returned to Louisiana for James and John's Baptism. Unfortunately, I got my flight time wrong and missed my flight. I caught the next flight out and arrived just in time to see the end of James and John's Baptism. I stayed a couple more days and visited Mom, Marc, Jackie and Steve and met John and James for the 1st time. They were about 6 months old. I cannot recall anything else about my visit (that's the problem with not taking pictures!). Mom and Marc came out to Sedona to visit us for Thanksgiving. We went to ENCHANTMENT RESORT® for Thanksgiving dinner and experienced an incredibly cold dining room and somewhat disappointing (for ENCHANTMENT®) food. I felt really happy to see Mom and Marc again and really enjoyed their visit. Mom looked good. 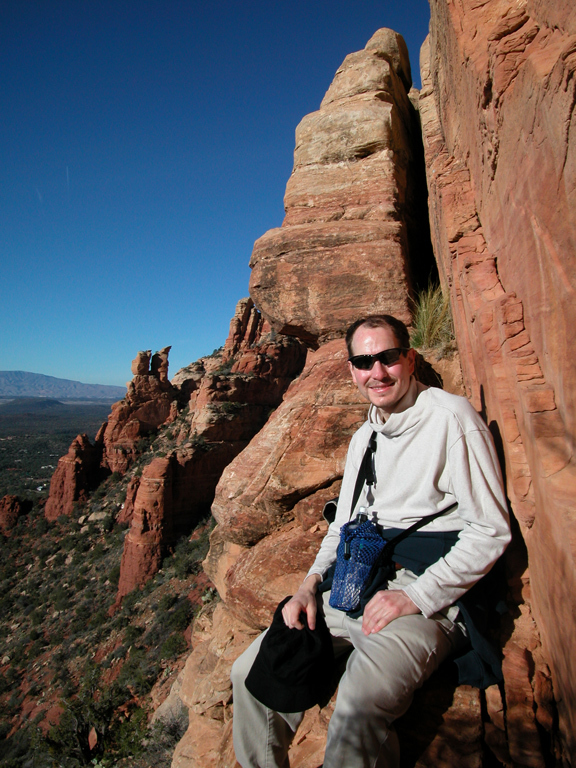 Marc and I did some hiking around Sedona. Specifically, we hiked Cathedral Rock 1 day. Another day we hiked part of the way up Thunder Mountain. For Christmas we celebrated at our friends Adam and Carmen's house in Cornville with other friends. other than that, we spent most of the year getting settled into our new house and adopting a new dog named Mandy (Mandy is now living with someone else because we could not keep her safely inside a 6 foot tall fence). And that was my 2004. 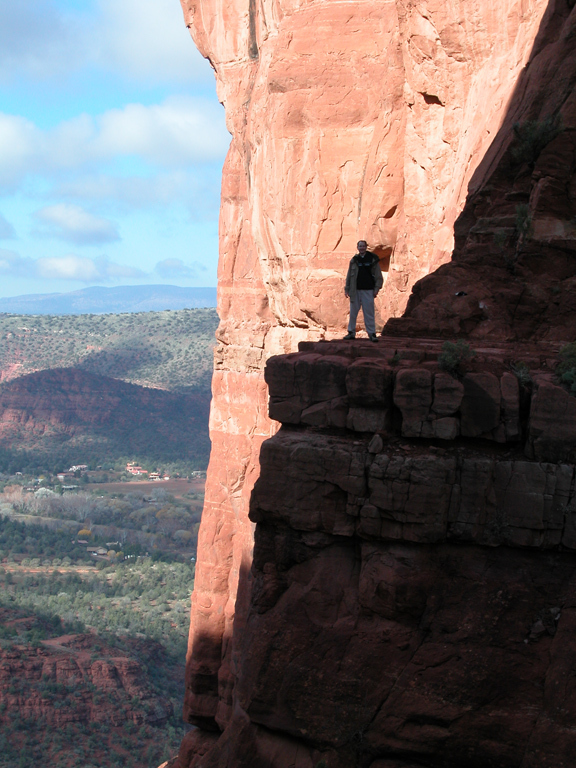 Marc near the saddle point on Cathedral Rock. ENCHANTMENT RESORT® is Trademark and Copyright its respective owner. Unless otherwise noted, this Website, Web Pages, and all of its contents are Trademark and Copyright 2004-2015 Daniel E. Maddux. All rights reserved.